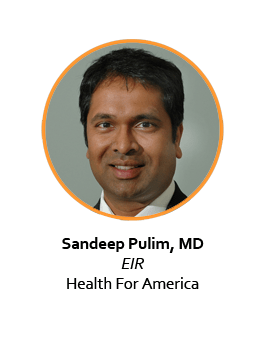 Sandeep Pulim, MD is a physician entrepreneur who currently is an Entrepreneur-in-Residence at Health for America. He co-founded a patient engagement company, HRS, which helps hospitals reduce CHF readmissions. Sandeep was also a “Floating Founder” at Blueprint Health, and a Health 2.0 code-a-thon winner. He previously served as Senior Medical Editor at MDLinx, an award winning, physician focused web site that aggregated information from 1,200 medical journals to keep healthcare professionals up to date. He has an intimate understanding of how new mHealth technologies, apps, and social media are changing the healthcare landscape for patients, providers, and payers.